Pinterest is now No. 3 in the US in terms of visits ! According to Experian Hitwise, Pinterest is now the number three most-popular social network in the U.S. in terms of total visits, just behind Facebook and Twitter. Pinterest got 21.5 million visits during the week ending Jan. 28, a nearly 30-fold increase over a comparable week in July. Pinterest beat its next-closest competitor, LinkedIn, in total visits in February. Foursquare only got 2.9 million visits in March and Instagram got 10.2 million. The report tracks visits rather than unique visitors, is based on web traffic and doesn’t factor in visits from mobile sites. ComScore, which doesn’t measure mobile traffic either, but ranks sites by uniques rather than total visits, did not include Pinterest in its list of the top 50 web properties in February. However, LinkedIn made number 27 with 36 million visitors. ComScore listed Pinterest as its number three “top-gaining” properties, however, with 17.8 million total visitors that month. ComScore’s March figures were not available at press time. “Time on site” is one of the most valuable metrics for social networks, publishers and online marketers. More than mere follower counts or even pageviews, the amount of time users spend with your content is always top priority in the quest for user engagement. Aprt from its exponential growth in users / traffic, it’s worth noting that the time visitors spend browsing and pinning on Pinterest has also increased sharply. Statista has gathered data from comScore to illustrate just how engaged Pinterest users have become over time in comparison to other networks. 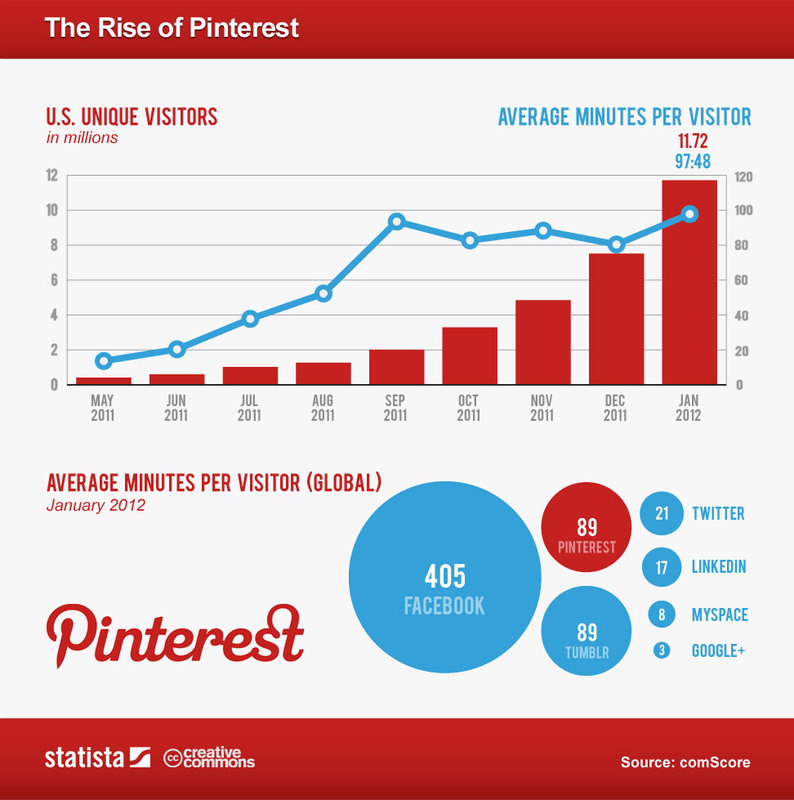 In January 2012, users spent the same amount of time on Pinterest as they did on Tumblr — on average, 89 minutes per user. Pinterest is also becoming a top traffic driver for women’s lifestyle, home decor and cooking magazines, some of which are seeing bigger referral numbers from the image-collecting service than from major portals like Facebook and Yahoo. Beginning this summer, Pinterest became the top social referrer for marthastewartweddings.com and marthastewart.com, sending more traffic to both properties than Facebook and Twitter combined. Pinterest is on track to become the second highest traffic driver (after Google) to Cooking Light‘s website, up 6,000% from just six months ago. The social bookmarking site already drives 10 times the amount of traffic to Cooking Light compared to Facebook. Pinterest is the fourth largest source of traffic for Country Living, up 150% from August to the end of January, and accounts for 3% of all referrals. Pinterest was among the top 10 referral sites for Self magazine. 87% of Pinterest users are women. The site also has a significant age range, with 80% of users fairly evenly distributed between 25 to 54. According to a comScore report, it was the fastest standalone site in history to pass the 10 million users mark, which happened in January. 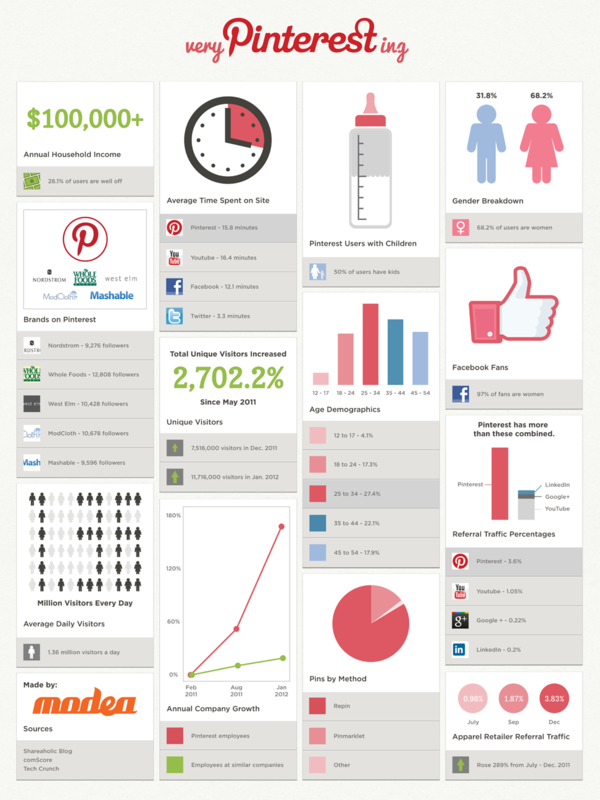 MDGadvertising has created an infographic explaining the nooks and crannies of the social network. Many brands — such as Etsy, Real Simple, Whole Foods and West Elm — are on board and have already amassed significant followings. In most cases, the traffic began organically. Style, home decor, weddings and food are among the most popular pinning categories among the site’s more than 10 million registered users, the majority of whom are women. Pinterest users turned to the websites of lifestyle magazines early on for material, and many publishers moved quickly to harness Pinterest’s potential as a traffic driver by creating their own branded accounts. 28 percent users have a household income of $100k+. Using user & usage stats from comScore and a few other analyses, full service agency Modea has put a few interesting facts about Pinterest users growth trends and usage statistics into visual form with this infographic. Pinterest made headlines when it reached 10 million visitors, making the now 2 year-old site one of the fastest-growing in history. Pinterest just has 12 people ! 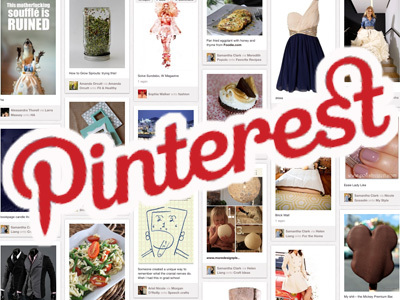 The Find, a vertical search engine, analyzed the top 300 online retail sites and found around 28 had Pinterest pins. Among the list, which was based on Internet Retailer magazine’s ranking, are Etsy, Tory Burch, Hanes, Barneys New York and Aeropostale. In each case, the pin appears when you click through to a specific item. About 9% of the top online retailers are offering Pinterest pins on their sites. In some cases, such as Hanes’, the pin is one of dozens of sharing options. But others such as Etsy put the pin in en elite group that includes Twitter, Facebook and email. Some 60% of the top 300 sites have Facebook Like buttons and 20% have +1 buttons from Google. Lemon.ly, a visual marketing firm, took a deep dive into the data to catalog Pinterest’s stunning rise and produced the infographic below. What’s clear is that with 10 million users, Pinterest has already made its mark in terms of web design influence, if nothing else. Pinterest users are primarily drawn to the network for four obvious reasons: 1. It's a place to make a statement about what inspires, motivates and guides the user. 2. It's a good list reference tool for cataloging photos, products, quotations and resources useful to the user. 3. Eye appeal. Who can resist eye candy. 4. It's an alternative environment that make products lists more acceptable in a social networks that was once a mix of personal dialog and photos. In addition to the above I find the Pinterest environment conducive to quickly drawing like-minded users together not unlike those who frequent craft fairs, conventions and product showcases. I find the like, share and comment excercise a powerful medium for making meaningful connections. For example, In our latest wedding planning book we feature an activity for the bride and groom that's called "A Few of Our Favorite Things". The activity involves listing only the interests the couple share in common. As time goes by that list gets longer as they bond closer having enjoyed sharing their mutual interests together. That said, Pinterest is the ideal venue for finding common interests among millions of users. As an event planning resource for reunions weddings and graduations it helps me showcase our latest printable invitations, flyers and event planning books. But I prefer to showcase without the price tag for very specific reasons. Users often find themselves focused on the image , it's source and the profile of the one who pinned it. It's important to pin a product in such a way that users are prompted to like it, comment on it and share and pin it. Putting a price tag on it says. "I Want You To Buy This", a real turn off for anyone whose surfing for eye candy. All things considered, it's probably most effective to have a product pinned by popular social personality or celebrity who has something intriguing to say about his/herself in connection to the showcased product. DIY crafts and books are becoming popular on Pinterest. This indicates that users are doing more than searching for eye candy. That said, a products best source link is a "How To" article or blog. I like to add DIY event planning books on my pin boards. I've learned that readers do well to link to the book's review pages and and authors of books should consider pinning from their authors profile.